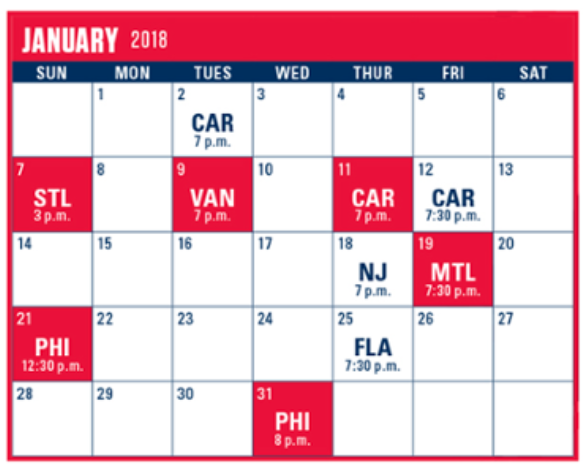 A Look Ahead to January: What are the Capitals Up Against to Ring in 2018? The 2017 calendar year was an exciting time to be a Capitals fan. With the New Year now underway, NoVa Caps takes a look at the teams the Capitals will be facing to begin 2018. Who will they face the most in the month of January? Which games will be the most exciting to watch? Any challenges ensuing? Look no further! Here is your guide on what to expect in the month of January. The Capitals will see the Hurricanes three times in the month of January. First they’ll kick off 2018 in Carolina on Tuesday the 2nd. and then take on the Hurricanes again on Jan. 11-12 in a back-to-back home-and-home affair. The meeting on Jan. 11th will take place at Capital One Arena and mark the return of Justin Williams, who signed with and re-joined the Hurricanes in the offseason during free agency. The Hurricanes carry an 18-13-7 record and are fighting with the Rangers and the Islanders for one of the two wild card spots. With this matchup being a Metropolitan Division affair, these three games will be important for both teams. The Capitals want to remain as far up in the standings as possible while the Hurricanes want to gain some ground. With the Redskins missing the playoffs once again, hockey and not football will take centerstage in Washington on the first Sunday of January as the Capitals host the Blues in a matinee affair. This game will be the first matchup between the two teams this season. The Capitals will travel to St. Louis on April 2nd. The Blues feature superstar Vladamir Tarasenko who has posted 16 goals and 22 assists for 38 points. Brayden Schenn is also having a solid year for the Blues as he leads the team with 17 goals and 24 assists, good for 41 points. The Blues sit at third place in the Central Division with a 24-15-2 record and have dropped seven of their last 10 games. The injury bug took a big bite out of the Blues with injuries to key forwards Jaden Schwartz and Robby Fabbri. The Capitals will host the Vancouver Canucks in the second game of their three-game early-January homestand. The Capitals will look to avenge a 6-2 loss to the Canucks back on Oct. 26 in Vancouver. This matchup will be the second and final meeting between the two teams this season. The Canucks currently sit at 16-18-5 with 37 points. They’re tied with the Oilers and Red Wings with the fifth-lowest point total among teams in the Western Conference. Brock Boeser leads the Canucks with 21 goals and 38 points on a team that has struggled to consistently produce offense. Boeser has been their bright spot and could be a finalist for the Calder Trophy (the award that goes to the NHL’s top rookie). The Sedin brothers continue to produce for the Canucks. Henrik leads the Canucks with 24 assists while Daniel has posted 24 points (eight goals, 16 assists). Part of the problem up in Vancouver is the injuries to Bo Horvat and Sven Baertschi. The Canucks have essentially played without their top line for over a month. Heading into Dec. 30th’s matchup between these two teams decided who will enter the 2018 calendar year in first place in the Metropolitan Division. It would be the Capitals who came out on top in that contest with a 5-2 win. If both teams continue to stay hot, this matchup at “The Rock” will promise to be an exciting one. The Devils are just a point behind the Capitals and carry a 22-10-6 record. The Capitals also won the first meeting of the season on Friday the 13th. The Devils feature 2017 first overall draft pick Nico Hischier who has seven goals and 17 assists for 24 points. Taylor Hall is also a big player to watch on the Devils as he leads the Devils with 24 assists and 36 points. The Capitals will take on the Montreal Canadiens for the second of three meetings between the two teams this season. Washington won the first meeting 6-1 in their home opener. The Canadiens feature former Capital Karl Alzner, who has assisted on five goals this season and is second on the team in blocked shots with 72. The Canadiens are led by Brendan Gallagher, who leads the team with 15 goals and Phillip Danault who leads the team in assists with 14. Gallagher, Danault and Alex Galchenyuk each have posted 21 points. Montreal is 16-19-4 with 36 points, currently eight points behind the Islanders for the second Wild Card spot. After falling to the Flyers 8-2 in Philadelphia on Oct. 14, the Capitals will welcome the Flyers to Capital One Arena twice in the month of January. The Flyers currently sit at 16-14-8 with 40 points, trailing the Islanders by four points for second place in the wild card. Claude Giroux and Jakub Voracek lead the Flyers with 46 points while Sean Couturier leads the team in goals with 18. Shayne Gostisbehere is tied for third in the NHL in points among defensemen with 29 points. The Capitals will take on the Panthers in their second of three meetings. Washington will look to get some revenge on the road after falling on their home ice to Florida back on Oct. 21 by a final of 4-1. The Panthers are 17-16-5 with 39 points, five points behind the second wild card spot. Jonathan Huberdeau leads the Panthers with 23 assists and while Vincent Trocheck leads in goals with 15. Both players are tied for first in points with 36. There is your brief look at what the Caps will be up against to open the new year. Also it’s worth noting that the Caps will have three lengthy breaks in this month. After they play the Hurricanes on Jan. 2nd, they’ll have four days off before hosting the Blues. That Blues game will be the beginning of a four games in six nights stretch before their bye week on Jan. 13-17. In addition, the Capitals along with the rest of the league will have an All Star break on the weekend of Jan. 26 with the All Star Game taking place on the 28th. It’ll be interesting to see how the Caps play after each of those rest periods. This entry was posted in News, Washington Capitals and tagged Carolina Hurricanes, Florida Panthers, Michael Marzzacco, Montreal Canadiens, New Jersey Devils, Philadelphia Flyers, Schedule, St. Louis Blues, Vancouver Canucks, Washington Capitals. Bookmark the permalink. 8 Responses to A Look Ahead to January: What are the Capitals Up Against to Ring in 2018?